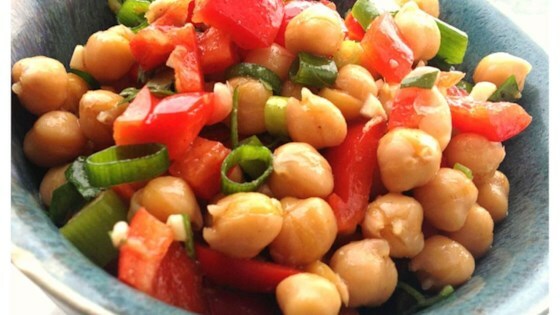 "This is a wonderful garbanzo bean salad that my grandmother used to make!" In a separate bowl, stir together the garbanzo beans, yellow bell peppers, green onions, and cilantro. Mix in the dressing. Cover, and chill in the refrigerator 8 hours, or overnight. Tasty as a wrap in an iceberg lettuce leaf. Cucumber added crunch and roasted red pepper added color. Red wine vinegar in the dressing gave a nice flavor and also added a hint of color. Doubled cumin and substituted parsley for cilantro. I get lots of requests for this one!